Posted on November 8, 2017 at 2:51 pm. This week’s Engage with APS updates. 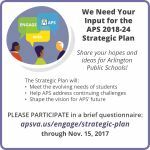 We Need Your Input for the APS 2018-24 Strategic Plan! The community can view the next round of middle school boundary options, FAQs, and comments received by APS on the APS Engage Middle School Boundary webpage by the end of the day, Wed, Nov. 8. These were developed after reviewing input from the community about the previous boundary options and exploring ideas shared at meetings, online, and via email. Superintendent Dr. Murphy will present one or more recommendations for middle school boundaries to the School Board on Tuesday, November 14. Anyone who would like to comment on middle school boundaries can speak at a School Board Public Hearing on Thu, Nov. 30. School Board meetings are held at 6:30 p.m. at the Education Center (1426 N. Quincy St.), with the citizen comment period scheduled for 7 p.m.. For information about speaking at a School Board meeting, visit www.apsva.us/school-board-meetings/sign-up-to-speak/. School Board action is scheduled for Thu, Dec. 14. There are two ways for the community to obtain information and share input in the process to develop APS guidelines for how digital devices—such as ipads and laptops, for example—are used to support student learning in grades 2-12. On Wed, Nov. 15, APS will host a community discussion from 7-9 p.m., at Washington-Lee High School (1301 N. Stafford St.). Staff will present information and review best practices from other school districts; then, participants will break into groups to discuss ideas to propose a Policy Implementation Procedure (PIP) that guides how digital devices support APS best instructional practices. For those who want to participate online instead, staff will post the presentation, supporting documents, and a community input form that day to the Acceptable Use webpage. The online community input form will be available November 15 through December 1. School Board action on this initiative is scheduled for Jan. 18, 2018.